This is a game released exclusively in Japan which aims to teach people how to type using a keyboard. 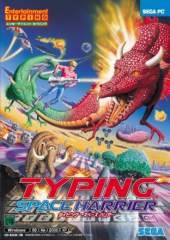 It follows in the footsteps of The Typing of the Dead, by attaching itself to an already established Sega franchise (in this case, Space Harrier). Like The Typing of the Dead it relies on the player hitting keyboard keys at specified moments as quickly as possible. So it's much like watching someone play a game of Space Harrier, except when enemies pop onto the screen, you need to type some Japanese words (in Romaji) to shoot them down. Type too slowly and you'll get killed. Quick single letters will also occasionally pop up.